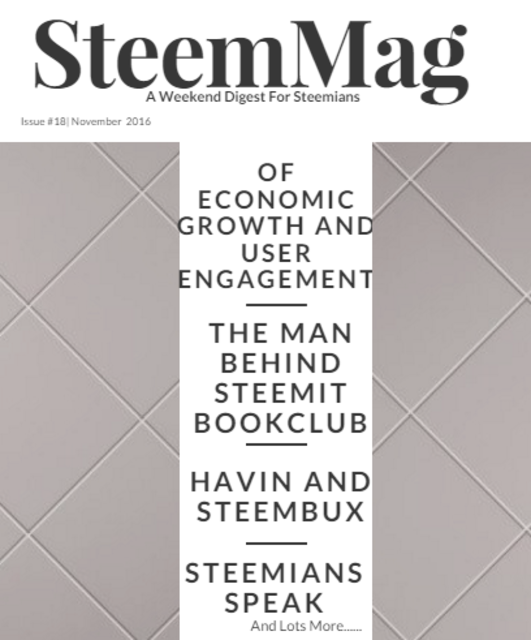 I’m highly delighted to welcome you guys to yet another edition of SteemMag, (the eighteenth edition), a weekend digest for Steemians. In honor of last week’s amazing SteemFest, I decided to skip an edition. And it's nice to be back again. From the conclusion of SteemFest, user engagement suggestions to various discussions on proposals made by @steemitblog, this week has been a pretty eventful one on Steemit. SteemMag reached out to @neilstrauss – an award winning Author and a speaker at Steemfest. He’s also the brain behind Steemit’s First ever Book Club. I also reached out to @mindhunter – the highest ranking Steemian based on Posts count. He makes more comments than even a bot! SteemMag had a chat with @williambanks- the developer behind Havin and SteemBux. I also reached out to a number of Steemians for the Steemians Speak Feature. What attracted you the most about Steemit? Conceptually, I'm attracted by the disruption that Steemit is: not just to social media and the financial system, but to journalism and publishing. Emotionally, I've stayed because of the excitement, supportiveness, self-organization, and interest-diversity of the community. What inspired you to start the Steemit Book Club? It grew out of my IntroduceYourself post. For some reason, I ended up writing most of it about my favorite book, James Joyce's fiendishly difficult Ulysses, which inspired me to write. I mentioned in passing the idea of reading it all together, and there was such interest afterward, I realized that we could create a new kind of book club: Where members are incentivized to tackle and complete more difficult works by getting to share the rewards from the Steemit Book Club posts afterward. One of the biggest problems I've seen with people trying to pursue their passions and interests is that many don't finish what they start. It's too easy to get distracted, get swept up in a newer interest, self-sabotage, manage time poorly, or give up when something gets tough. So this is a good microcosm for incentivizing that. How has it been running the premier Book Club on Steemit? It has been beyond exciting. First, there's the fun of sharing a passion, and in the future getting to enjoy others presenting their favorite books. Second, there's the high level of discussion and insight from Steemians. And then, there's the excitement of moving these online relationships into more personal, direct interaction--whether on the phone with the Steemit Book Club or in person at Steemfest here in Amsterdam (where I'm writing this from). I want to thank @the-alien for setting up the book club chat channel, arranging the weekly calls, writing many of the posts, and being the heart and soul of this. Steemit is currently undergoing some changes. What has been your favorite moment so far? And what changes would you like to see more on Steemit? My favorite moment is always the present moment, in whatever I'm doing. And the change that I'd like to see is...a Save as Drafts feature. I mentioned this to Team Steem here, and it looks like it's a priority. Where do you see Steemit in the next 6 months? Want to join the Book Club? When and How did you discover Steemit? I really thought we had a killer app here for a crypto-coin and started blogging on Steemit in late July. As the highest ranked commenter on Steemit, what motivates you to engage writers on their posts? To help them try to be the best writers that they can possibly be. Quality does tell quite quickly on Steemit, and your reputation can rise quickly if you can write the basics well. I try to encourage other writers with their funnies, aid the minnows in their quest for Steemit knowledge and try to keep the regulars happy too. Sometimes I'll send some Steem to a user if they've done something extra special whether their a minnow or whale. For example, yesterday I send @smooth some Steem for his excellent FUD fighting skills! Who are your favorite authors and what has been the most exciting reply you've gotten? I think the best writer on here is @ericvancewalton, though I'm big a fan of @krnel @radioactivities @pfunk and @charlieshrem. I like how @charlieshrem throws his heart at Steemit like some kind of catharsis. I can tell Steemit has made him a better man ... same for me too. The most exciting replies I get are those from @radioactivities - I think she's the best commenter on Steemit, and was one of the first minnow friends I made on Steemit. Follow her today! What's your opinion on the recent curie announcement to reward comments? Some of the best writings I've seen on Steemit have been in the comments section - they've blown me away! (and not the post writing itself), so this definitely deserves its rewards too. Which features do you feel will encourage better user retention and interaction in Steemit? I'd love to see private messaging on Steemit within the platform, and not external to it. I'd also love to see the Promoted section done away with and create a new CEO/Devs tab that informs all users of recent hard forks / news etc. There is a lot of empathy and love on Steemit that is lacking in the real world. People find that a comfort here, hence can learn things they might not learn in the bigger world. Thanks @mindhunter . Its amazing that you find the time to interact with several posts every day. Thanks for making Steemit a nice place to share one's views. I have to say, Neil is just too kind. I'm just trying to help and contribute a little, he's doing a lot of good! And I thank him for not only the Book Club but for what he does for steemit. And Thank you too man for the work you do with this @infovore! As usual, great edition! You have my continued support! Was wondering how does one fit a mind hunter book club bank in a magazine anyways? Very enlightened!! I think for the sake of the planet we all need to live in this moment. So many things will fall into place. Agreed, I take this approach too. It is much easier to go with the flow and just focus on what little piece of the puzzle I have influence over. So many things will fall into place. You're right. Its difficult though. We tend to get anxious and wish to control the state of affairs. Getting too anxious over the future ruins the beauty of the present. Thanks for dropping by @jamesc. Heard steemfest was a blast! Hey @mammasitta! Great to have you back again on Steemit! And thanks for dropping by.. Im so glad you had lots of fun.. Your FB updates made getting over the disappointment much more easier.. Thanks as always for your wonderful steemmag!